All qualified candidates for CRET Level III are hereby informed to be Present on the Department of Physical education along with the synopsis and all original documents on 13/02/2019 at 01:00pm for presentation and interview. · The Viva-Voce of Mr./Ms. Geetika Garg, candidate for the D.Phil. Degree of the University on the subject of his/her thesis titled as, “STUDIES ON THE ANTI AGING EFECT OF SULFUR CONTAININAG AMINO ACIDS IN RATS” will be held on 08/02/2019 at 10:00am. at the Department of Biochemistry AU: by Prof. Mahendra Pratap singh, and Prof. S.I. Rizvi.Members of the Academic Council are invited to attend but no T.A./D.A. will be paid. · The Viva-Voce of Mr./Ms. Ranjana, candidate for the D.Phil. Degree of the University on the subject of his/her thesis titled as, “Q.S.A.R. as a Tool for Modeling of Some More Effective Anti Cancer Drugs” will be held on 14/02/2019 at 11:00am. at the Department of Chemistry AU: byProf. Tabrez Alam Khan, and Prof. A.K. Srivastava. Members of the Academic Council are invited to attend but no T.A./D.A. will be paid. B.A./B.Sc. Part II Practical Examniation will be held in the Department of Psychology on 14 & 15 February 2019 from 10am on each day. 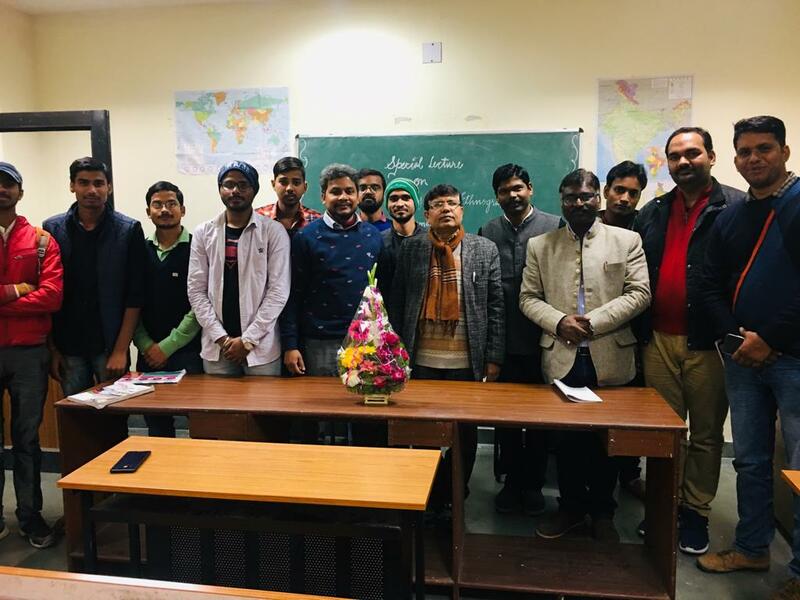 The Department of Anthropology, University of Allahabad organised a Special Lecture on Social Theory and Ethnography on Friday 1st February 2019. 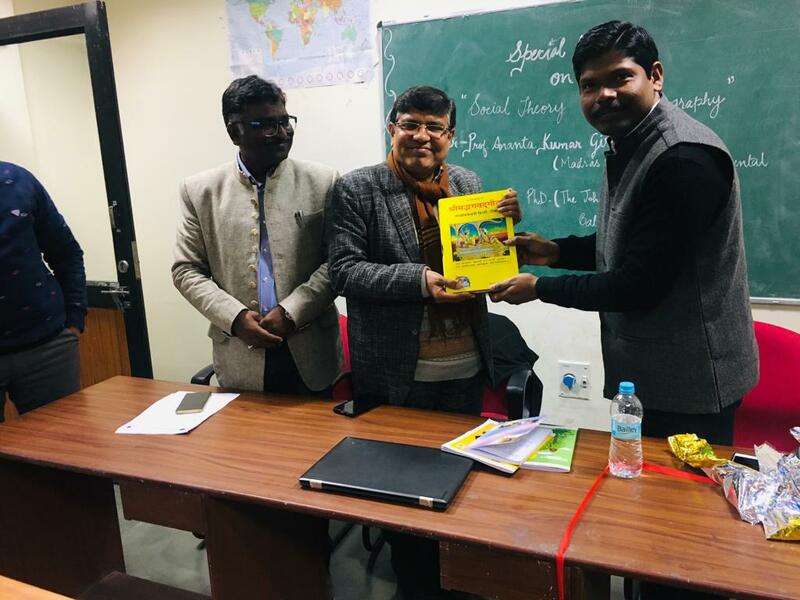 This lecture was delivered by renowned anthropologist and sociologist Dr. Ananta Kumar Giri, Professor at the Madras Institute of Development Studies (MIDS), Chennai. With a PhD and Masters from the Johns Jopkins University, Baltimore, USA and an impressive Delhi School of Economics lineage, Prof. Giri has taught in many Universities in India and abroad including the University of Sunshine Coast Queensland, Australia; University of Kentucky (USA); Aalborg University (Denmark); University of Freiburg (Germany); University of Western Ontario, Canada. He has been a fellow of Alexander von Humboldt and Rockefeller Institute, USA. Prof. Giri discussed the many aspects of the social theory and ethnography. He argues that theorising is a dynamic movement of self, culture, society, and the nature as it is related to our actions, reflections, meditations to understand the world more meaningfully and holistically as well as to transform it. But much of social theorising in the modern world is primarily Euro-American and despite the so-called globalisation of knowledge, this condition of one-sided Euro-American valorisation of knowledge and neglect of others continues unabated. He emphasises for a new vocation of social research by pleading for a simultaneous engagement in activism and creative understanding, fieldwork and philosophical reflections, ontological self-cultivation and epistemic labour of learning. He proposes Anthropology and Sociology as Quest for a Good Society. For him, through social theory we try to engage with a spirit of critique, creativity and transformations. He contended that ethnography of the margins has been the discourse of anthropology. The event was chaired by Dr. Rahul Patel, Assistant Professor, Department of Anthropology, UoA. Dr. Patel introduced the theme of the event and opined that if social theory is all about thinking social life scientifically; then ethnography is an interpretative, reflexive and constructive process which is highly dependent on thickly described case studies and fieldwork. He stressed that ethnography is both process as well as product. 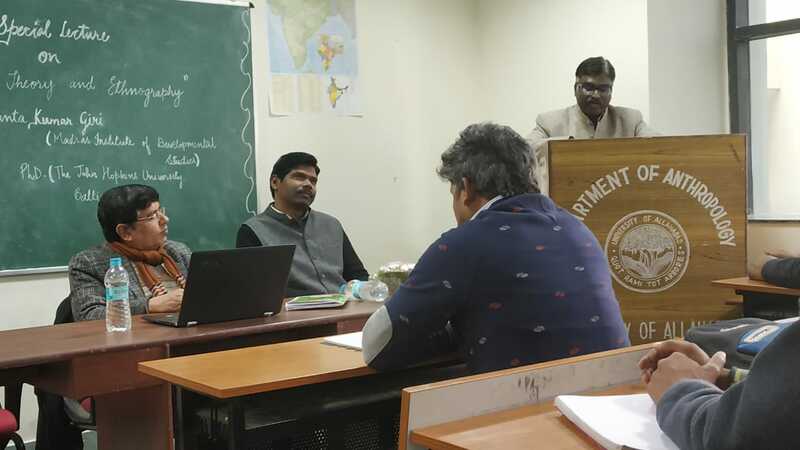 Dr. Subhasis Sahoo,Assistant Professor, Department of Sociology, raised his concern that how to deal with cultural ethnocentrism by studying one’s own community/village/50-100 kms. far off from one’s own locality/residence. 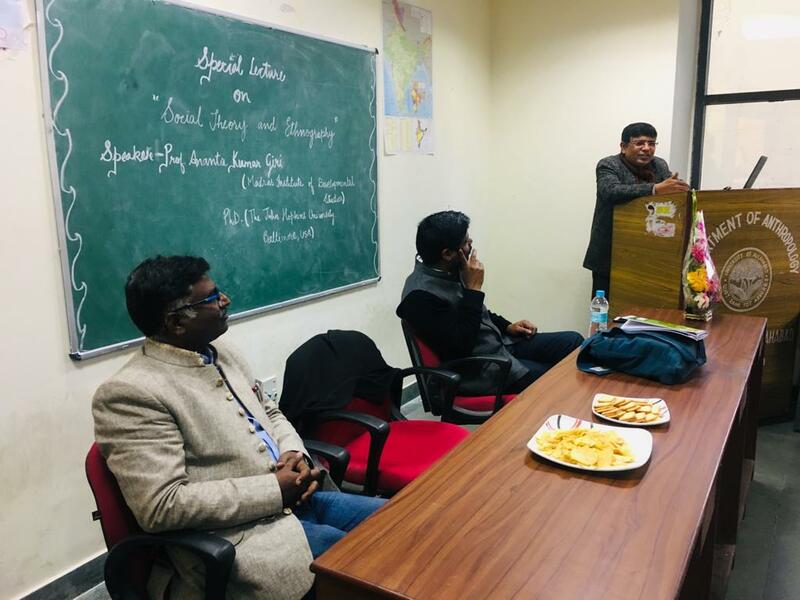 Dr. Sahoo further argued that each theorist’s work we study in relationship to some other relevant social theorists as part of ecology of thinking and theorising Indian society and the world. 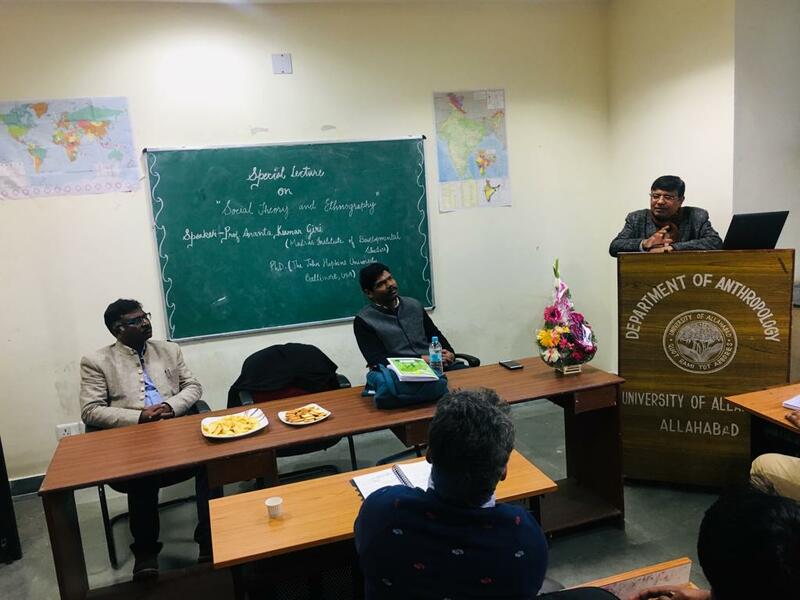 Dr. Khirod Chandra Moharana, Assistant Professor, Department of Anthropology, remarked that there is a dynamic relationship between self and society. The on-going creative transformation in self and society has been the matter of analysis both in anthropology and sociology. Understanding this creative transformation can be possible through ethnography. 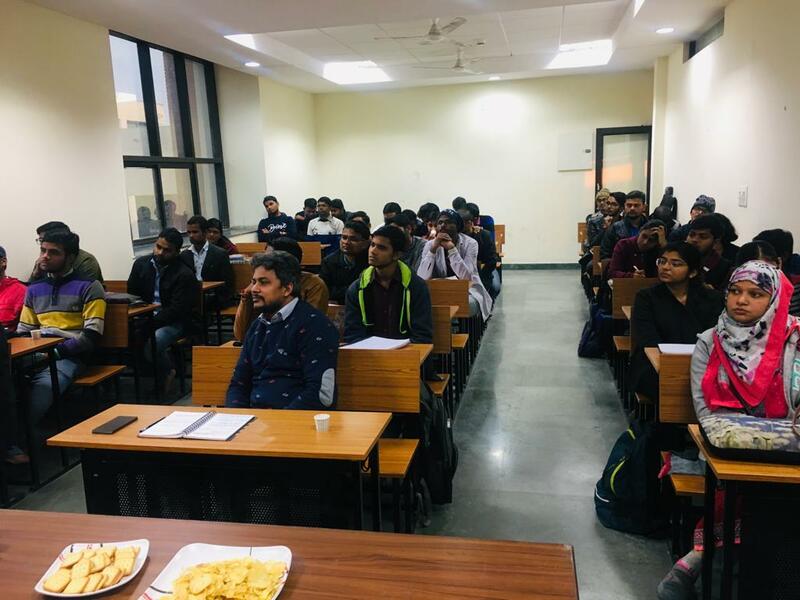 Prof. Giri responded to a bunch of queries raised by students hailing from Anthropology, Sociology and Political Science namely, Anmol, Ajit, Mohan, Pradyumna, Abhishek, Rishbah, Brijesh Gupta, Shruti Sinha. The event began with the presentation of bouquet to the key speaker by Dr. Waseem Fatima followed by the presentation of the copy of Srimad Bhagvad Gita by Dr. Khirod Chandra Moharana. 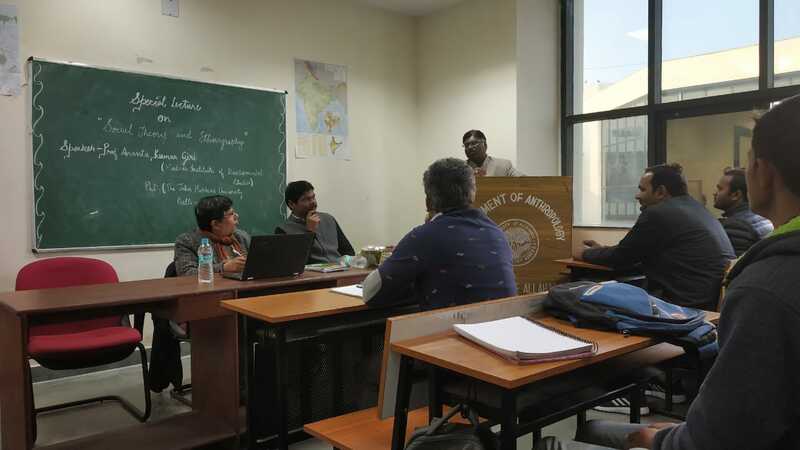 The event was attended by the faculty members, research scholars and students of Anthropology, Sociology and Political Science, namely, Somesh Kumar, Rajkamal Shukla, Rohit Singh, Avesh Gautam, Prabhakar Singh, Atul Maurya, Anand Mishra, Shruti Singh, Chanderpal Gautam, Shivam Asthana and many more undergraduate and postgraduate students. 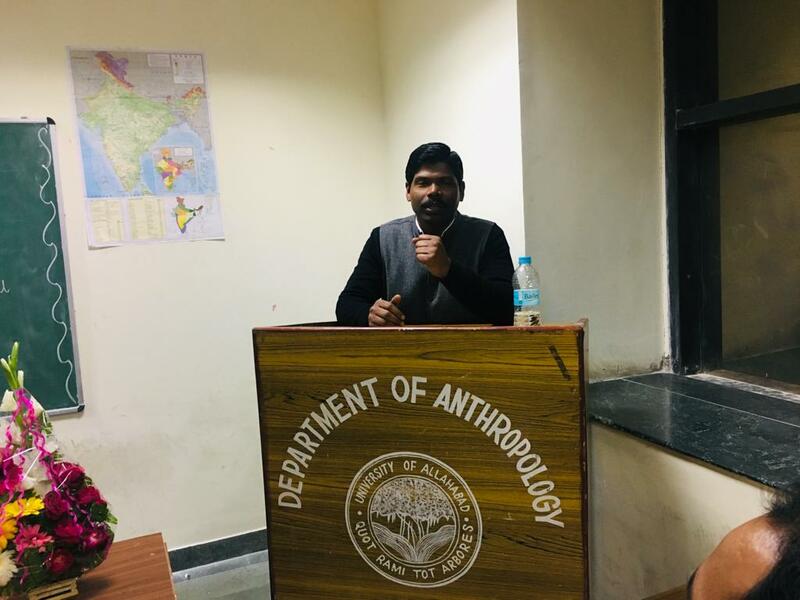 Mr. Vikas Pandey, UGC-JRF & research scholar, Department of Anthropology, successfully compered the programme and offered formal vote of thanks.